"You, you, and you. . . panic. The rest of you, come with me." -- Anonymous U.S. Marine Corps, Gunnery Sgt. Grunt Life begins with a suicide attempt by the main character, Benjamin Carter Mason, from whose first point of view perspective the story is narrated. A survivor where all his men are dead, Mason has given everything he's going to give and is ready to call it quits by jumping off a bridge when a man, whom Mason dubs Mr. Pink, appears out of nowhere with a proposition he is not allowed to refuse until he has been given all the details. Mr. Pink tells Mason about the Cray, aliens who have been sending spies to Earth for years to learn about human weaknesses. The world's governments knew about it, but found it too costly and did nothing to prepare. A private conglomerate took over the mission and are recruiting special grunts to join Task Force OMBRA to fight the Cray and save humanity when the time comes. Mason is taken to a different kind of facility at a remote location where he finds other reluctant recruits who have also been given a second chance to train as a unit and fight the impending full-blown alien invasion -- one that takes place off the pages, quickly and with devastating results while the unit is still in training. They go on to fight the aliens, and attempt to figure out how best to defeat them. There are terrible loses, sacrifices, and sad wins, but by the bitter end of their first mission, they do have a better idea of how to deal with the Cray. Grunt Life is a military science fiction novel with all the bells and whistles. It has the detailed military weapons and new gadgets, -- a powered exoskeleton suit! -- military strategy, suspenseful moments, and men and women with military experience capable of accomplishing the mission as central and secondary characters. Post-invasion, there are action-packed scenes of gruesome, bloody battles with some seemingly invincible aliens. 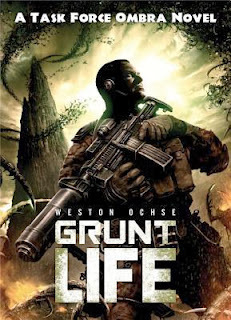 However, Grunt Life also has the inner perspective of a man (the narrator), and a close group of people whose experiences in war led to suicidal attempts due to PTSD. Ochse delves into both subjects throughout the novel and as a result his characters, the grunts, become more than just characters on a page. This is where this novel really shines because although he weaves in bug-like aliens, action-packed battles, and neat military toys and strategy, this story is really about the effect fighting and war has on the men and women who do the fighting. Ochse achieves a stronger impact by setting his science fiction novel in present times and making most characters either active soldiers or veterans of current conflicts in places such as Afghanistan and Iraq. The end of Grunt Life: Task Force OMBRA is left open. This is the first battle and there's a post-invasion war happening. Mason and the rest of the grunts have more to do, and I for one am looking forward to reading the next installment in Ochse's series. 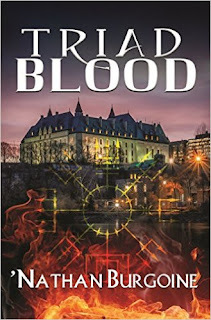 About the Author: Weston Ochse is the author of twenty books, most recently SEAL Team 666 and its sequel Age of Blood, which the New York Post called 'required reading' and USA Today placed on their 'New and Notable Lists.' His first novel, Scarecrow Gods, won the Bram Stoker Award for Superior Achievement in First Novel and his short fiction has been nominated for the Pushcart Prize. His work has appeared in comic books, and magazines such as Cemetery Dance and Soldier of Fortune. He lives in the Arizona desert within rock throwing distance of Mexico. He is a military veteran with 29 years of military service and currently returned from a deployment to Afghanistan.